To prepare mint syrup: place sugar and light corn syrup in a heavy saucepan. Cover with water. Add in a handful of washed mint leaves. Simmer over low heat until sugar dissolves. Raise heat, bring to a boil, then reduce heat and simmer for 10 minutes. Cool and strain. Brew your favorite tea your favorite way, adding a handful of washed mint leaves during brewing. 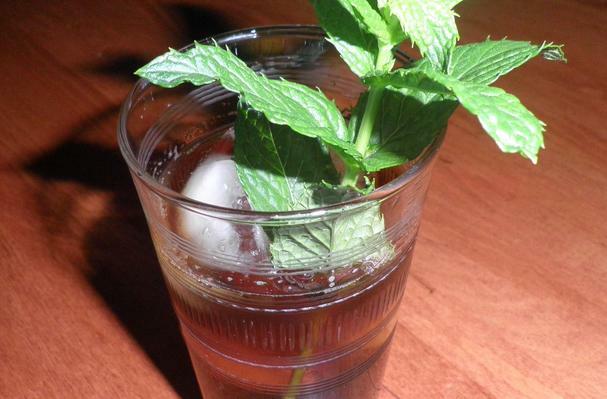 Sweeten brewed tea with 6 to 8 ounces of mint syrup. Chill. Nice! Love fresh peppermint in cold drinks. A "secret" recipe from a good friend. Enjoy!